LAKELAND H.S. CHEER APPAREL is now available to order online. IMPORTANT - PLEASE READ ALL OF THE IMPORTANT INFORMATION BEFORE ORDERING. ORDER DEADLINE IS SUNDAY, JANUARY 20th. NO ORDERS WILL BE TAKEN AFTER THE JANUARY 20th ORDER DEADLINE. All orders will be held until the order deadline, and processed in bulk. Approximate delivery will be 7-10 days after the order deadline. IMPORTANT - We cannot guarantee delivery time frames. The delivery estimate above is based on normal order processing and can change based on production capacity and product availability with our vendors. We always try hard to deliver all orders as soon as possible based on theses factors. 1. "IN-STORE PICK UP" - when orders are complete, they will be delivered to a team practice. There is no extra charge for this option. 2. "U.S. MAIL" - when your order is complete, it will be mailed via US MAIL to the address on the order form. There is an additional charge for this option (cheapest of the home delivery options). 3. "UPS GROUND" - when your order is complete, it will be shipped UPS GROUND SERVICE to the address on the order form. There is an additional charge for this service (most expensive of the home delivery options). VERY IMPORTANT - ALL ORDERS ARE CUSTOM MADE TO ORDER, AND MAY NOT BE RETURNED FOR SIZE EXCHANGE OR FOR REFUND. PLEASE BE SURE TO ORDER THE CORRECT SIZE. PLEASE BE SURE THAT YOU WANT THE ITEMS YOU ARE ORDERING. For help with sizing, there is a size chart on the description page of each item. 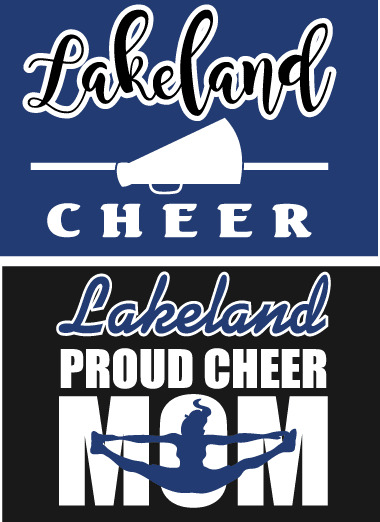 You may customize the back of the shirts with cheerleader name, at an additional cost. The option is on the description page of each item. Logo sizes are approximate for the mock ups provided, and will be a standard print size on the shirt fronts. Normally 10 to 10.5" wide. IMPORTANT - YOU WILL HAVE YOUR CHOICE OF "GLITTER" OR "REGULAR" PRINTS FOR EACH ITEM. THE DEFAULT SETTING IS "GLITTER", IF YOU WANT A "REGULAR" (NOT GLITTER) PRINT YOU MUST SELECT THAT OPTION. Please click on the items below for a complete description of each item, and to order. Please contact SPORTS & APPAREL with any questions you may have regarding any item below, or the order process before you order. PHONE: 517.223.1157 EMAIL: Email us through the "CONTACT US" link on this website.